Michael Kopke, director of marketing for Kia Canada, told Automotive News Canada a five-minute spot at the Toronto auto show isn't enough time to talk about all the new or redesigned vehicles the automaker is rolling out this year. 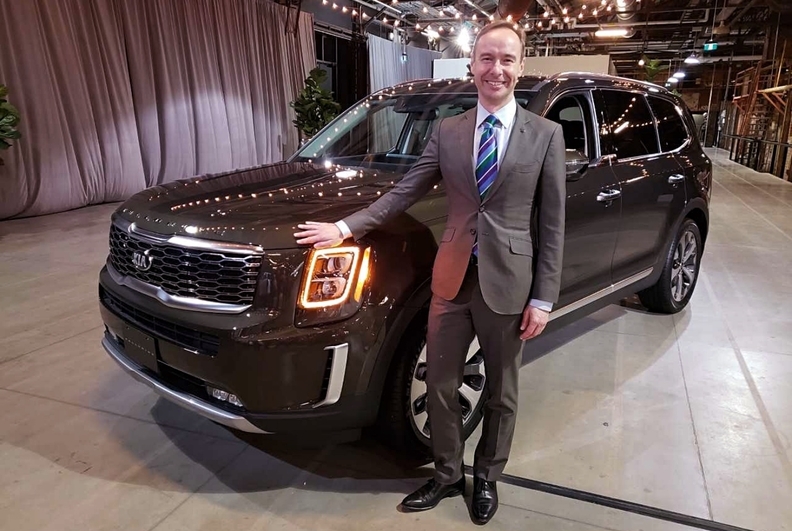 TORONTO — Kia Canada’s new three-row Telluride SUV made its Canadian debut Tuesday at a private event in a rented space in downtown Toronto, getting a head start on the Toronto auto show for a reason, the company says. The automaker also had the new Soul, new Niro EV and Forte 5 on display Tuesday. The four vehicles will be featured at Kia’s sizeable stand at the Canadian International AutoShow in the Metro Toronto Convention Centre’s north building. The show opens to the public Feb. 15. The media preview day takes place on the day before, and more than a week after Tuesday’s launch event. Kia is not a part of the CIAS presentation schedule. “We have a lot of vehicles to launch,” Michael Kopke, director of marketing for Kia Canada, told Automotive News Canada. “We’ve got Forte 5, the new Telluride, the new Soul, and the new Niro EV. Even the Stinger is still brand new. And we won two AJAC awards. Kopke said that the brand’s desire to do things differently, with launches separate from the auto show or otherwise, stems from the automaker’s internal culture. “I asked the question myself when I started with the company,” Kopke said. “The signature lighting we have on our cars is a little bit different on every single car. It's not that sort of Eurocentric consistency and evolution. Though the Telluride hits the market amid red-hot SUV sales, the company’s initial sales targets are on the conservative side relative to how its competition is faring. The production version of the new Telluride was first unveiled at the North American International Auto Show in Detroit in January. It arrives with an Atkinson-cycle 3.8-litre V6 that makes 291 hp and 262 lb.-ft. of torque paired with an eight-speed automatic transmission and standard all-wheel drive with four-wheel independent suspension. Canadian pricing has not yet been announced, but the list of features that will be standard equipment is extensive. On top of heated front seats and Apple CarPlay and Android Auto functionality, several safety features will be rolled in at entry level including rear blind spot collision avoidance assist, rear cross-traffic collision avoidance assist, lane keep assist, highway driving assist, a rear seat reminder system, and safe exit assist, a feature first launched on the latest Hyundai Santa Fe that keeps the rear doors locked if a vehicle is approaching from behind. Several features that ease in-vehicle communication are optional such as driver talk, which uses a microphone to help a front row voice project backward in the cabin, and quiet mode, which delivers infotainment audio to the first row only so that rearward passengers can better hear their own devices. Six USB charging ports are standard, two in each row.